This isn't mine mind you, this is a UFO of my mother's. 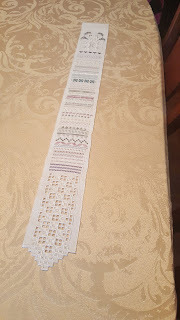 They were talking about Lavender and Lace projects at sit and stitch and I started picking on my mom about this one as its been in the attic for YEARS! 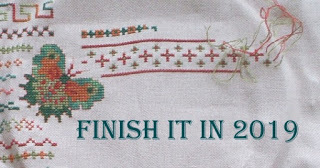 She finally admitted she decided she didn't like it as well as the initial thought and had no plans to finish it... I was only more than happy to take it off her hands. I probably won't get working on it right away as I want to get Earthdancer done first but I did get her all pressed out and ready. 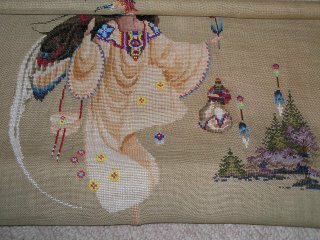 Speaking of Earthdancer I have her beads all on now I just have to be brave and thread up the Bravo thread for the dream catcher *cringe* I'm going to wash it tonite to reduce bleeding of the color and put that on the "to do" list for the weekend. 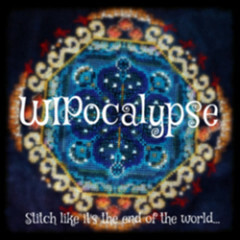 WIPocalypse, hosted by Measie. 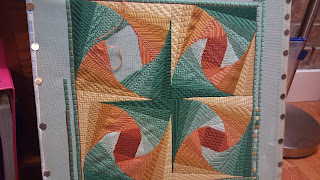 Its the end of April, ok 2nd of May because I'm lazy, and amazingly I've made some progress on my oldest WIP, Twister. Its entirely possible that I might actually finish this one. 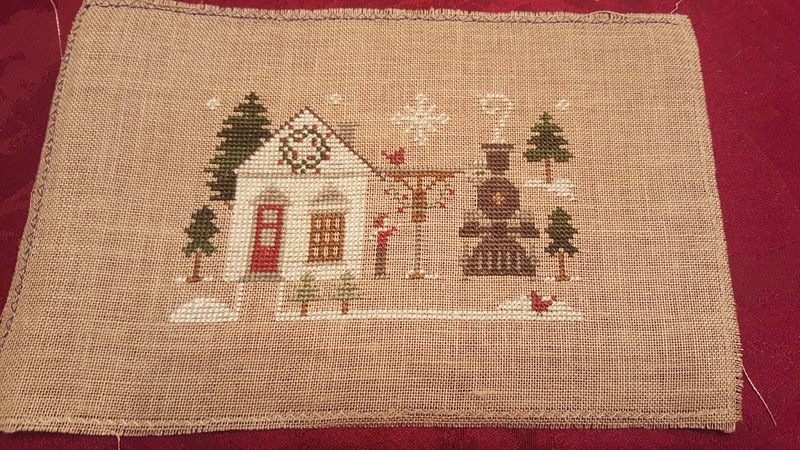 I'm on my last square with 7 sections left to stitch, then I just need to finish up the border and I can finally pull the tacks and block this one for framing. I usually don't block my work but Twister has had a hard life. I started this when it was published, so long ago I've forgotten. Its moved 3 times and suffered a lot of abuse that a canvas would have taken but congress cloth isn't quite as sturdy. I made a few changes but I can finally call this one finished. This was a piece I started with my old EGA chapter in Michigan in 1999 when the design was released and now I just need to find hardware to hang it as a bellpull on the wall. 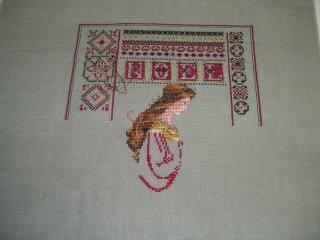 The bottom hardanger section was intended to have more decoration between the bars but I decided to leave them as they are. Some of the designs included just were not coming out as well as I wanted so this has been sitting since early last year when I did the cutwork, with all the different stitches and colors in the bands, there is plenty going on with this one that I'm ok with leaving the bottom a little more simple than was originally intended. 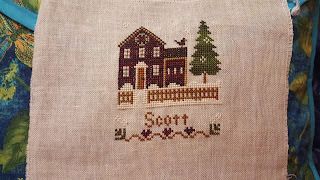 First a finish, the first design 'My House' I'm still debating adding something on either side of my last name, it seems a bit thin there with so few letters. This has been sitting near done for quite a while, my life has been crazy the past 6 months with changes to my life I never expected, so my attention has been elsewhere. I looked at the photo last night to share and realized I had missed the leaves on the ends of the vine so I got that finished up to call this one done. Now that things have calmed down I also have a good amount of progress on the Main street Train Station. At the moment there is a glaring error in color choice on the roof of the station but I can't make up my mind if I dislike it enough to frog it. It isn't unrealistic to have 2 different materials or colors on the building so I may end up leaving it, I'll decide when I get more done and see how it looks with the whole design.